I was asked by CEO Robert Joe, a young, educated Navajo with impressive corporate experience, to help Navajo Nation Oil & Gas Company as a consultant since the corporation was formed under my administration. Since November 2013, because the organization is complex and difficult to understand, I saw a need to educate the pubic and decision makers about the company. It is a corporate entity that has "shareholder representatives" that are members of the Navajo Nation Council. Their role is to serve as oversight authority for the NNOGC board and they represent the "sole" shareholder, which is the Navajo Nation. The shareholder concept is a totally new to many Navajo people. This structure is the cause of the conflict between a board recently reinstated by the Navajo Nation Supreme Court and the shareholder representatives. My job was to explain this corporate structure, including recent amendments to the section 17 Federal corporate charter we received in 1998. In light of the conflict, there are several things that are very troubling and even outright revolting about the Navajo Supreme Court opinion of June 20, Case No. SC-CV-25-14. In all the years our government has grown, that court opinion stands out because of how it was handled by the judicial system and the close relationship amongst the chief justice and two lawyers involved in the Supreme Court decision. The attorneys whose conduct I am very concerned about are Louis Denetsosie, who is a former Navajo attorney general, attorney Paul Frye, and Chief Justice Herb Yazzie. Denetsosie and Yazzie went to law school together and with Frye they all worked alongside one another for the past 40 years in various legal positions on the Navajo Nation. Throughout both Yazzie and Denetsosie's terms as attorney general, Frye received numerous legal service contracts. According to a recent estimate by current Attorney General Harrison Tsosie, Frye has received $5 million to $6 million in contract work from the Navajo DOJ. In January 2014, the NNOGC board authorized the filing of a lawsuit in the Window Rock District ("district court" ) to seek legal relief against five removed or suspended board members -- Diandra Benally, Mae-Gilene Begay, Lennard Eltsosie, Jennifer Hatahali, and Nelson Toledo -- because they refused to comply with the terms of their removal or suspension. But while the dispute was still pending in district court and before hearing and ruling on any evidence, as the district court is required to do, Frye and Denetsosie took the case away from the district court and filed directly with the Navajo Supreme Court, thereby preventing the district court from exercising jurisdiction over the case. Then, Navajo DOJ took sides with Denetsosie and Frye, rather than stand for truth and justice. Attorney General Harrison Tsosie filed a pleading with the Supreme Court on May 21 asking the court to do what Frye and Denetsosie wanted: recognize Frye as the proper legal counsel for NNOGC, rule that Robert Joe is no longer CEO, rule that the five removed or suspended board members are still legally authorized board members, and that the shareholder representative's removal actions were unlawful. Tsosie served as the deputy attorney general for Denetsosie for seven years from 2004 through 2011. Tsosie did Frye and Denetsosie a huge favor despite strong recommendations from his own staff not to do so. It is not rocket science to understand the behind-the-scenes maneuvering. It breaks my heart to even think that our judicial system would conduct business like this. How many other Navajos have been treated the same way on their cases? In 1985, while I was chairman, I worked very hard with many others to set up the current judicial system and the Supreme Court. Our vision was to build a fair judiciary that had integrity and followed the law all in the name of strengthening our tribal sovereignty. The power of the Supreme Court was not meant to be abused or misused for one's own benefit or to benefit a select few. There are many people who see through the smokescreen and the very dangerous consequences of the Supreme Court's June 20, 2014, ruling in the NNOGC case. For one, the Supreme Court made judgments on all the disputed facts in favor of Frye and Denetsosie even though the trial court had not accepted any evidence. Not a single person was called to testify about the facts the entire time. This means they only looked at one side. In addition, the Supreme Court did not allow the shareholder representatives to speak on their own behalf at the hearing and made rulings against them on disputed facts. It's like being muzzled while the other side gets a chance to explain. Now, those unsupported rulings against the shareholder representatives prevent them from correcting the current problems and abuses at NNOGC. Another disturbing outcome is that the Supreme Court went out of its way to single out and target Robert Joe without giving him any opportunity to defend himself personally and held him personally responsible for the mess when all he was responsible for was turning Denetsosie and Frye's $30 million loss around. Is this justice? When Chief Manuelito said "Go, my son, education is the ladder," he did not mean that once you climb that ladder, you get thrown off by the old guard. What people see are blatant violations of due process by the Supreme Court that I thought would never be possible. It is because of these blatant violations of due process that the shareholder representatives had to defend the Navajo people and seek immediate federal protection and relief from such clear abuse. The Supreme Court effectively silenced the voice of the Navajo people by denying the Navajo Bill of Rights and due process rights of the shareholder representatives. Instead of voicing outrage at the Supreme Court's clear infringement of the Navajo Bill of Rights, Frye and Denetsosie supporters along with DOJ began screaming "sovereignty" through press statements. The filing in federal court was only the symptom of what really placed our sovereignty at grave risk. The cause for placing our sovereignty at risk is the Supreme Court's abuse of its power and the people's need for protection from such abuse of power. The damage to our sovereignty caused by the Supreme Court's June 20 opinion extends far beyond the violations of due process. While this conflict was playing out in the media a qualified CEO applicant for the Navajo Transitional Energy Company left after reading about what was happening at NNOGC. Who would want to do business with a tribe where the tribal court systems plays favorites, and does not respect due process? The best way to clear up the cloud hanging over our judicial system is through a public hearing. This includes a review of DOJ's role. It is time we take a serious look at the true cause of the damage to our sovereignty. There is an immediate need to fix the mess created by the June 20, 2014, decision, and the Supreme Court should be reformed to prevent any further abuse. 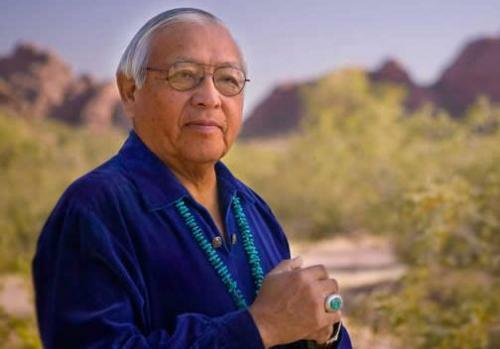 Peterson Zah served as executive director of the Diné be'iiná Náhiilnaah bee Agha'diit'aahii (DNA) People's Legal Service from 1967-1981. Under Zah's leadership, several of DNA's legal cases related to Indian sovereignty reached the U.S. Supreme Court. He served as Navajo chairman from 1983 to 1987 and Navajo president from 1991 to 1995.